We’re likely to hear those words from thoughtful friends who display their intimate concern as well as their religious absent-mindedness when we go out in public after Mass on Ash Wednesday. The distribution of ashes replaces the penitential rite at the beginning of Mass. Instead of merely “calling to mind our sins,” we receive a very public reminder of our sinfulness. “Turn away from sin and be faithful to the Gospel,” we hear. As penitents, they used to wear ashes on their heads or in their clothes. Symbols of human mortality, ashes represented their complete dependence on the mercy of God. In the middle ages, the support groups dwindled but sinners remained strong in numbers. So Pope Urban II ordered up the first Ash Wednesday in 1091. Ashes were for everybody, and we’ve been rubbing dirt on our foreheads ever since. Dirt is something we’re constantly washing off children and ourselves. 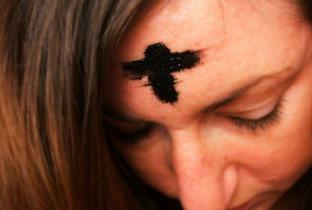 Only in church do we deliberately put dirt on the most public part of our bodies, our foreheads. Ashes are what’s left in the now-cold fireplace. Ashes heat the barbecue. Ashes are all that remains of the home after the tragic fire. Ashes enrich the compost heap. Ashes of the faithful departed fill commemorative urns. Ashes represent destruction, refuse and waste, but they hint at new life. Long before recycling became popular, the church got into the act on Ash Wednesday. Ever wonder what happens to those palm branches left over from last Holy Week? They’ve been burned into ash, stuffed into bags and now await the chance to dirty your forehead on Ash Wednesday this year. The symbol of Christ’s glory has become the symbol of our sin. On Ash Wednesday, you’re not just another dirty face. No, you’ve tossed yourself into the recycling bin of Lent, ready for renewal this Easter. "The blessing and imposition of ashes should take place either in the Mass or outside of the Mass. In the latter case, it is to be part of a liturgy of the word and conclude with the prayer of the faithful."